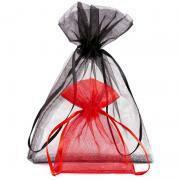 We specialise in high quality decorative bags made from delicate, transparent organza, synthetic crinoline, jute and satin. 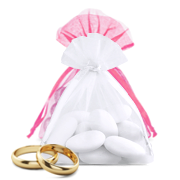 Our products are for decorative use and are ideal for storing, packing and beautifully presenting small items of any kind. 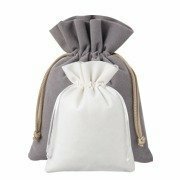 Available in a wide range of sizes, colours and shapes to suit different uses and all tastes, we also offer a range of rectangular and round bags made from organza fabric. 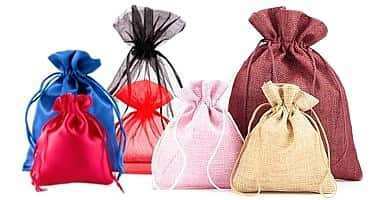 As well as offering an extensive range of colours we also have a selection of seasonal bags available in either jute or printed organza. 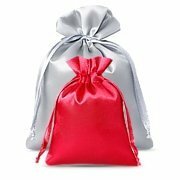 If you are interested in placing a bulk order we are able to customise pouches with your chosen logo or graphic as well as being able to manufacture organza bags in bespoke sizes and colours. Please get in touch to discuss your requirements. 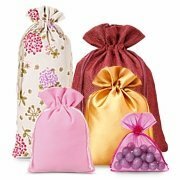 Our clients use our fabric bags and pouches as thank you gifts for their wedding guests, gift wrap for presents for all occasions, such as Christmas presents, Halloween candy; or decorative packaging for a bottle of wine. 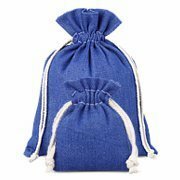 Wholesale and retail clients that we cooperate with buy our pouches as packaging for their lavender, luscious soaps, or handmade jewellery. 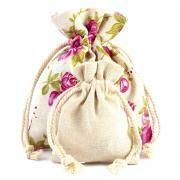 There are endless ideas on how to use our alternative gift packaging. They also have applications in the kitchen, or as a plant pot decoration in your house. 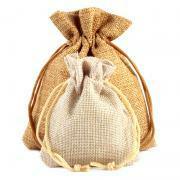 Organza bags are ideal protection for a bunch of grapes, shielding from insects and birds. Express postage to Great Britain. Products bought in our online store will be quickly delivered to cities such London, Glasgow, Bristol, Liverpool, Manchester, Sheffield, Birmingham, Coventry, Nottingham, Edinburgh, as well as Preston and Portsmouth. Are you interested in wholesale order quantities? 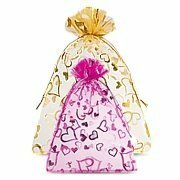 With us, you have a guarantee that the pouches you purchase are coming directly from the manufacturer. Printed decorative bags (for example name, logo, slogan, or image), personalised for individual projects consulted with us. 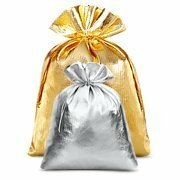 We give maximum effort ever time to ensure that the time of delivery of a wholesale order as well as the final price are satisfactory for you.